Simply putting up historic numbers is not going to get Mike Trout noticed by the media. It's not enough, it hasn't been enough for half a decade. He used to be able to use Anaheim as an excuse, but Ohtani plays in Anaheim and has no problem being a media darling and a household name. Mike Trout's problem is that apart from being incredibly good at baseball, he's boring. He needs off the field issues. If he starts acting like Manny Ramirez, he'll get media attention. Especially once Tatis comes up for San Diego and breaks all of his records. Ohtani has the benefit of being from Japan. Often Asian players who do well in American sports and have name recognition in their home country before they came here draw a lot of extra attention. In addition, Ohtani is doing something that no one does anymore pitching and hitting at an All-Star level. I'm sure if Trout continues his dominance this season people will start talking about it more later in the year, but I'd bet there are people who have had comparable 1/3 seasons before. It won't really be news until we get to late August if he's sustaining the pace. Then people will notice, but WAR, OPS and other newer stats don't draw the attention that AVG, HR. do. Not saying that's right but the vast majority of fans who follow baseball have no idea what bWAR is or why it differs from fWAR. Heck, the vast majority of those fans have never even visited Fangraphs or Baseball Reference. I don't recall Frank Thomas getting much national press for his amazing 1994 season before the strike either, but again, statistical excellence across many different categories doesn't carry the same eye appeal as extreme dominance in one. Last edited by voodoochile; 05-28-2018 at 09:47 AM. Can you imagine? Right now he'd arguably be what, the 6th best player in team history at the age of 26? Behind Frank, Pierce, Appling, Fox, Aparicio, and Shoeless. It's too bad we didn't draft him cause that'd be insane. I’d add Walsh and Collins to your list but your point is well taken. Simply putting up historic numbers is not going to get Mike Trout noticed by the media. Who cares about the media? Mike Trout's problem is that apart from being incredibly good at baseball, he's boring. He needs off the field issues. This is what its come to? Ha! I am such a poker fool that I had to look up what a string bet is. That's why I love this site! Actually no, Ohtani is below Trout in terms of the offense and the defense components of the game. I'll go out night after night with Trout and you can take Ohtani. 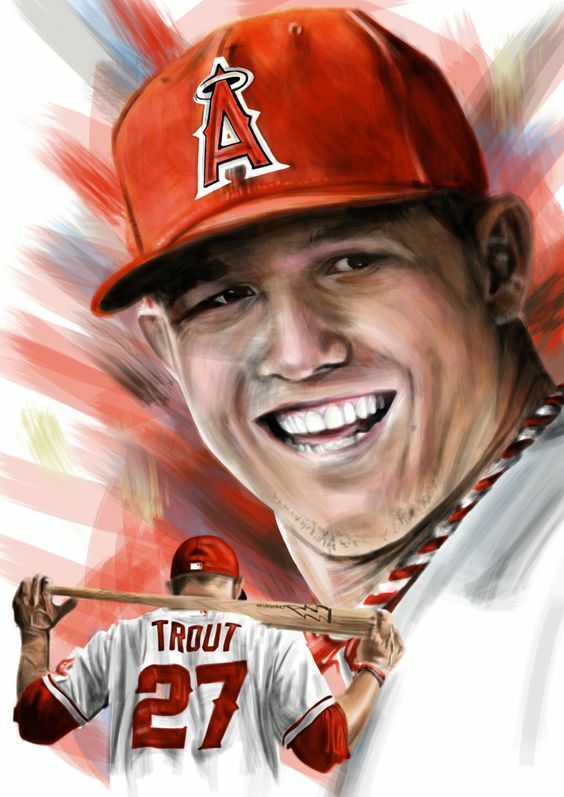 Over his last 37 PA's, Trout is slashing .696/.778/1.158 with 4 home runs, 11 walks, and 9 RBI's. He's walked more than he's struck out for the entire season, which is unheard of in this era. Oh and now he's leading the majors in runs scored, home runs, walks, OBP, OPS, OPS+, total bases, intentional walks, and he's already at 6+ bWAR and fWAR for the season. Still on pace to break Babe's record. My favorite Mike Trout highlight from this season thus far. His 5 hit night against the Yankees. Many more Mike Trout highlights posted for your viewing pleasure. Last edited by Wsoxmike59; 06-21-2018 at 11:21 AM. Reason: Additional Comments to make. If he was on our team I'd be a season ticket holder. Me too. We're truly fortunate that the game keeps regenerating itself, when I first started watching baseball I saw guys like Aparicio, Banks, Mays, Aaron, Clemente, Killebrew, Carew, Rose, Bench and then the next generation of stars, Seaver, Carlton, Nolan Ryan, Reggie Jackson, George Brett, Molitor and Yount, Fisk & Frank Thomas all the way in to today's stars, Bryce Harper, Mike Trout, Aaron Judge, Jose Altuve, Giancarlo Stanton, Mookie Betts and others. Mike Trout definitley belongs in their class. Your impressions of Mantle and Frank Robinson? I never got to see the Mick play live in person but my older brother did, and he still remembers the game he went to and saw Mick homer from both sides of the plate against the Sox. I only saw him at the very tail end of his career and he was a shadow of his former self. Now Frank Robinson, was a HOF'er and I only remember his Oriole years. Frank could do it all. Hit, run and field. My all time NL Outfield would be Hank Aaron LF, Willie Mays CF and I often go back and forth between Robinson and Clemente for RF. It's that close between them in my eyes. Vote Mike Trout AL All Star Please!